The Jaguar X-TYPE will get a fresh new look for 2008, along with a host of new features inside and outside the vehicle and a new automatic transmission in the 2.2 diesel. With significant revisions including nearly 500 new components, the new generation X-TYPE retains all the original car’s strengths and adds some new ones. The new X-TYPE’s exterior styling is significantly refreshed, with changes that clearly reflect some of Jaguar’s new saloon car design language, while subtle interior revisions give more choice of trim and equipment, to further emphasise its luxury car credentials. For the first time in this model range, the new X-TYPE offers the combination of diesel power with automatic transmission – pairing the 2.2 litre diesel with a six-speed automatic and the one-touch control of Jaguar Sequential Shift – broadening the new model’s appeal to buyers who previously could not have this combination in an X-TYPE. The new X-TYPE automatic diesel combines refinement with performance and economy, and promises more choice and even greater luxury, to appeal especially to a younger, more family-orientated audience. 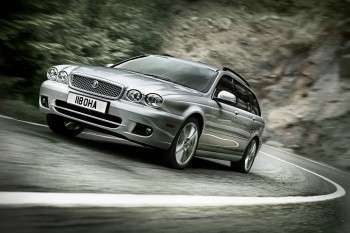 The new Jaguar X-TYPE in the UK in March 2008 and throughout Europe in April 2008. It is expected that an Australian release will take place much later in 2008.